With AVG Internet Security you get a worry-free online experience every time. The multiple layers of protection mean you don't have to worry about identity theft, spam or viruses. And it'll even prevent you from accidentally visiting harmful sites. AVG Internet Security can keeps your private information safe from known and unknown threats. It can prevents hackers from seeing inside your computer. It will ensures every web page you visit is safe. internet tool to help you be able to surf, search, download, bank, shop safety. Qweas is providing links to AVG Internet Security 2012 as a courtesy, and makes no representations regarding AVG Internet Security or any other applications or any information related thereto. Any questions, complaints or claims regarding this application AVG Internet Security 2012 must be directed to the appropriate software vendor. 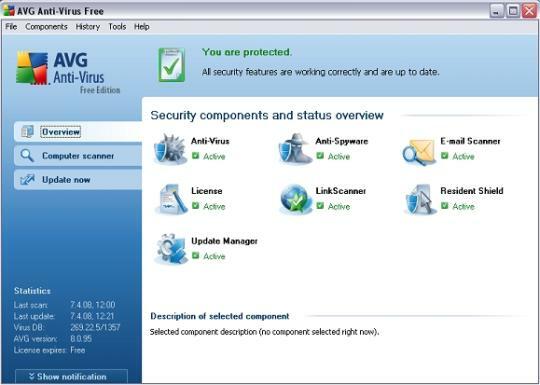 You may click the publisher link of AVG Internet Security on the top of this page to get more details about the vendor.